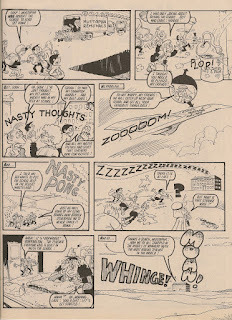 Who could have predicted that Crystal Belle, whose mono-toothed appearance was in stark contrast to Cheeky's multitudinous molars, would make her Cheeky Weekly debut in edition number 39 dated 15 July 1978? 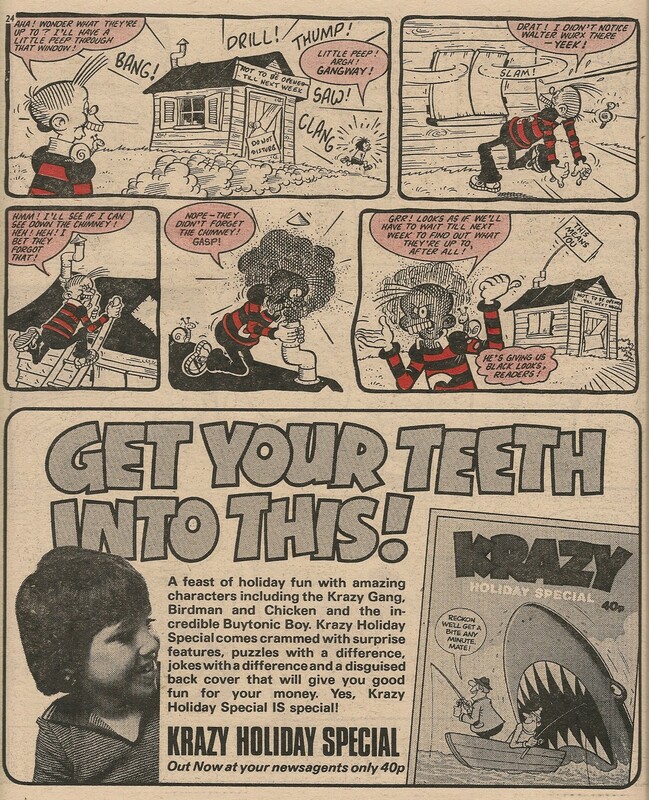 Certainly not erstwhile readers of Krazy (the comic which spawned our toothy pal before being wound up with a final issue dated 15 April 1978), from which the comical clairvoyant was entirely absent. Cheeky's second encounter with Crystal occurred a week later when, unable to locate that week's edition of the Mystery Comic, the toothy funster was nonetheless able to enjoy the perplexing publication by means of her mystic sphere. A nice piece of Frank McDiarmid art, depicting Cheeky's prognosticating pal conjuring visions of impending hilarity from her magical apparatus, adorned the cover of the 12 August 1978 edition of Cheeky Weekly. Within that issue, Crystal was among a selection of Cheeky's pals who appeared at various junctures during Cheeky's canal barge holiday. 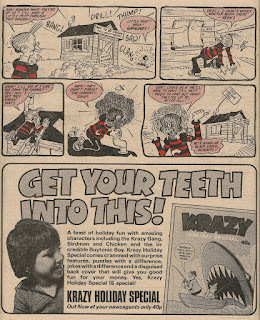 A week later Crystal, whose distinctive dentition suggests she may be a relative of Whizzer and Chips' Sweet Tooth, played a key role in one of the most memorable Cheeky Weekly issues, as her scrying skills afforded Cheeky a view of his life, and those of his Krazy Town chums, 60 years hence. Crystal was able to help Cheeky enjoy his weekly perusal of the Mystery Comic on more than one occasion. 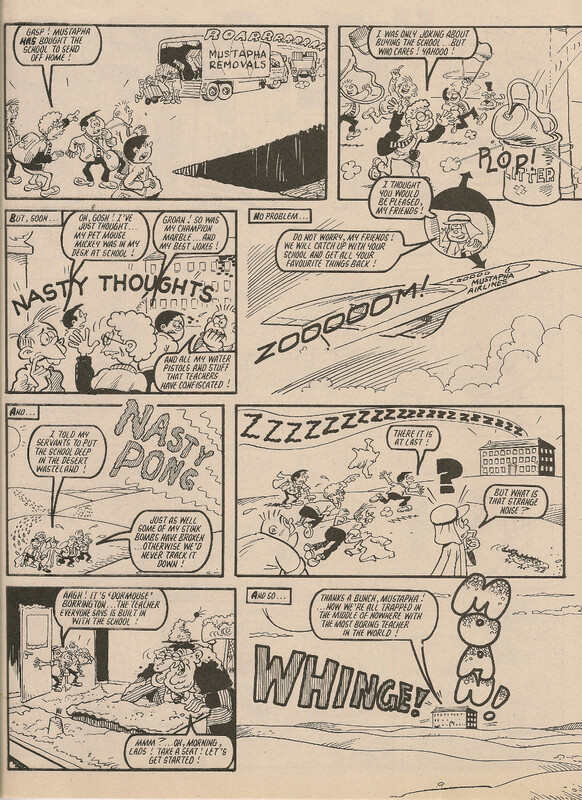 The young mystic's prophetic pronouncements featured throughout Cheeky's Week in the 23 September 1978 edition. This was the issue featuring the highest number of appearances by Crystal, whose soothsaying was in evidence on 8 pages. 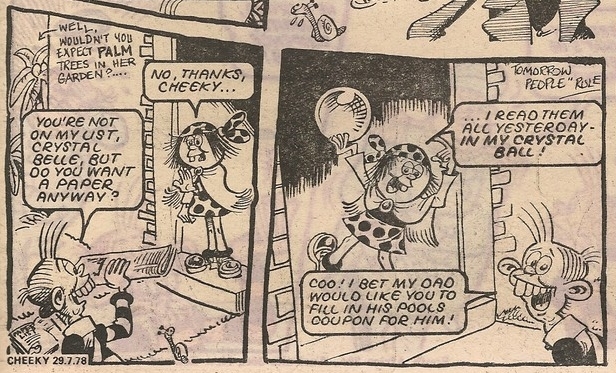 Occasionally, the juvenile prophetess would be seen without her crystal ball, as in the 30 September 1978 comic, when her plan to tell Baby Burpo's fortune by means of a pack of (presumably tarot) cards was thwarted when the mischievous mite took rather too literally the instruction to cut the pack. Also making use of a pair of scissors was an art assistant in the Cheeky Weekly office, whose deft handiwork resulted in Crystal being shoehorned into the final panel of Jimmy Hansen's Monday page in Cheeky Weekly cover-dated 26 May 1979. 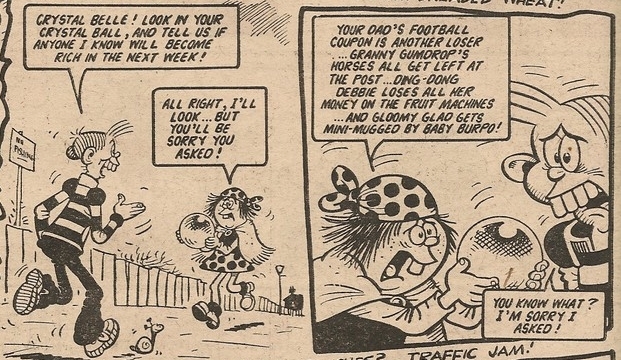 The Burpo Special in the comic dated 23 June 1979 showed young Ms Belle delivering a masterclass (mistressclass?) in divination as she answered Burpo's questions in advance. Six months later the youthful mystic was seen predicting fun for all as Cheeky's Christmas lunch-and-party commenced in the 29 December edition. The Saturday 2-pager in the comic dated 19 January 1980 began with Crystal telling Cheeky that she had made predictions for a number of his pals. Our grinning hero then spent the rest of the strip consulting his fellow Krazy Town dwellers in order to compare the forecasts of the mysterious orb with what had actually transpired. 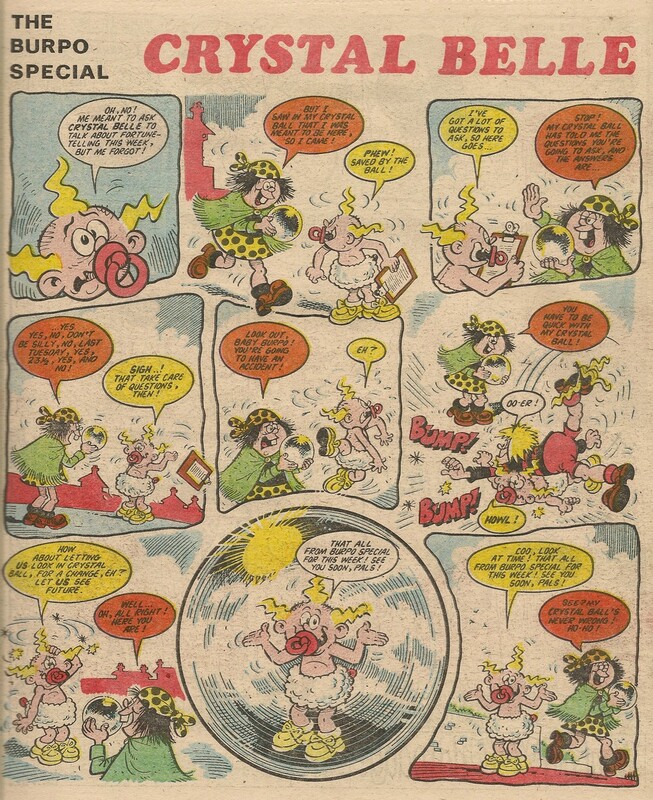 The adolescent seeress made her final Cheeky Weekly appearance in the last issue, dated 02 February 1980. 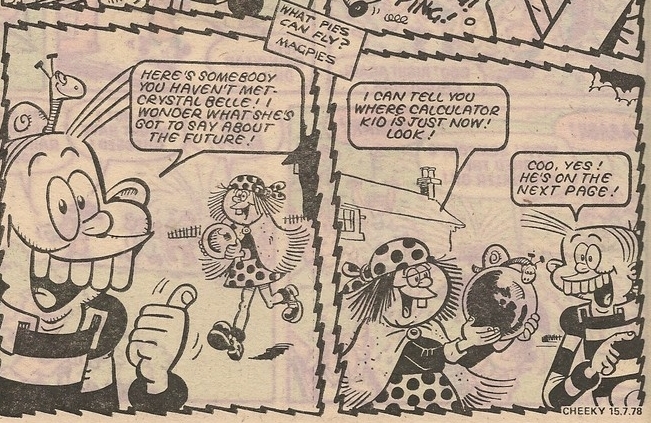 Her role in that momentous edition was to be the first of Cheeky's pals to inform our grinning hero that 'tremendous news' lay in store for him. The news (hardly tremendous) was that as of the following week Cheeky Weekly would be absorbed into Whoopee! 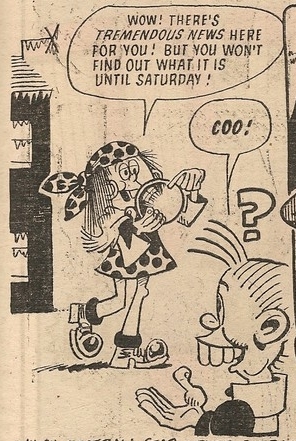 Crystal's augury (not to mention her rather fetching spotty ensemble) was on display in a total of 59 issues, and her longest absence from the comic (probably due to unforeseen circumstances) was the 8 weeks between 01 September and 27 October 1979. 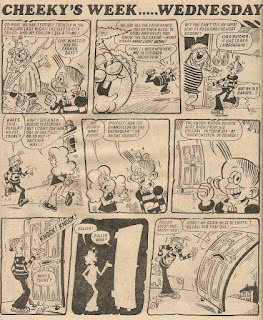 Whizzer and Chips dated 22 October 1988, over 2 and a half years after Cheeky's weekly comic appearances came to an end. Mustapha Million is the sole Cheeky Weekly survivor, now being drawn by the mighty Frank McDiarmid. Unusually, Frank didn't sign this strip. This unexpectedly late entry in the Other Cheeky Artists series is the result of my decision to reassign some Cheeky's Week artwork credits from Mike Lacey to Jimmy Hansen. Jimmy Hansen had been the regular artist on Skateboard Squad since Cheeky Weekly's first issue. 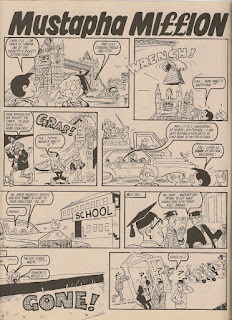 The Squad's adventures came to an end in the comic dated 12 May 1979, but Jimmy would return to drawing the characters when they adopted their new guise of Speed Squad two weeks later. Jimmy's first Cheeky's Week work appeared a week after Skateboard Squad came to an end. In that first post-Skateboard Squad issue, cover-dated 19 May 1979, Jimmy's art appeared in two Thursday elements. 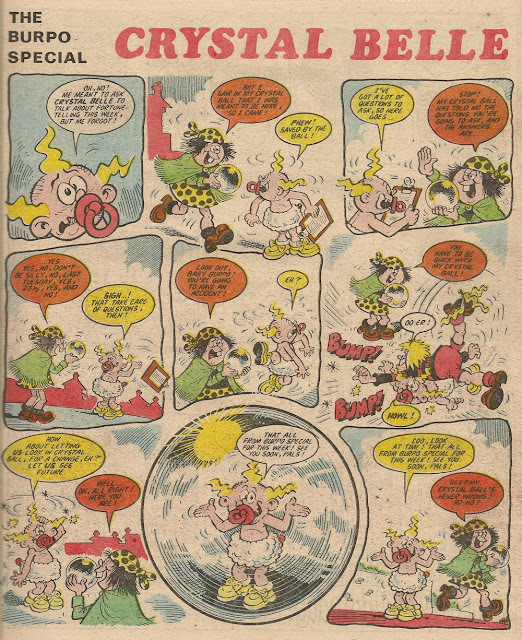 My guess is that, possibly due to a failure to communicate to Frank McDiarmid the news of the Skateboard Squad's termination, Frank's original Thursday page included a final panel that introduced the sensational skateboarders, as he had done many times before. Jimmy provided a substitute final panel and, appropriately given his long association with the Squad, he also furnished a half page teaser strip in which the toothy funster attempted to determine what the terrific trio were up to. Jimmy Hansen's first Cheeky's Week work - final panel. Continuation of Thursday from the same issue. 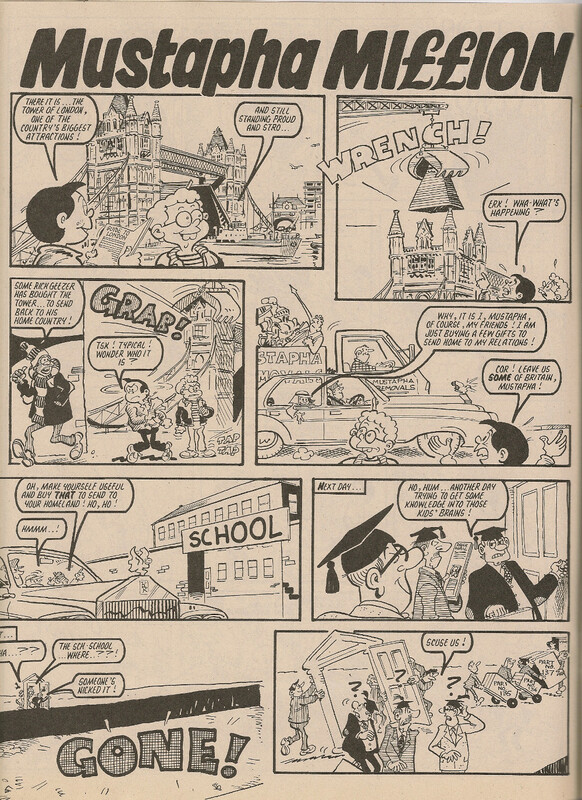 The following week, in addition to illustrating Speed Squad's one-and-a-half page debut, Jimmy provided artwork on four Cheeky's Week pages. 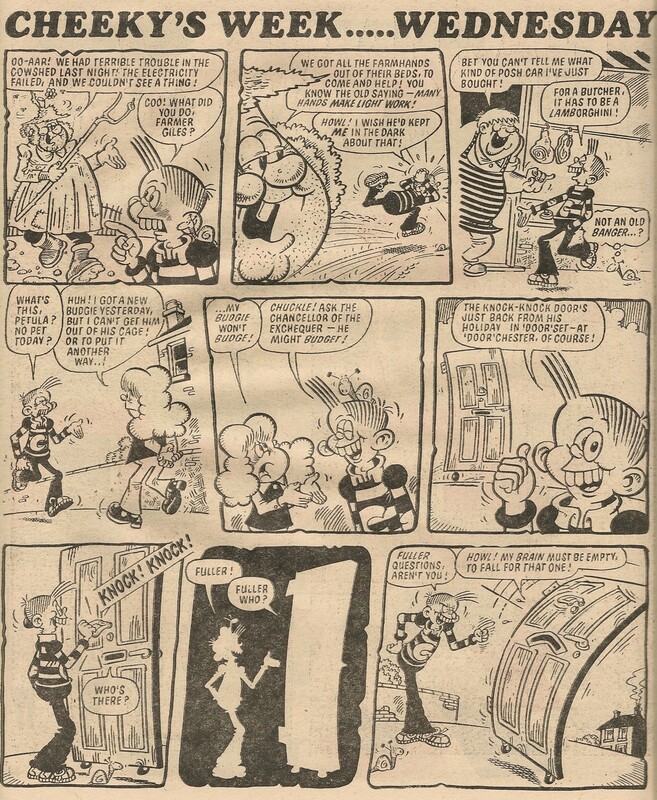 There was no further Cheeky's Week art from Jimmy until the comic dated 15 September 1979, in which Mr H delivered four more elements featuring our grinning pal. 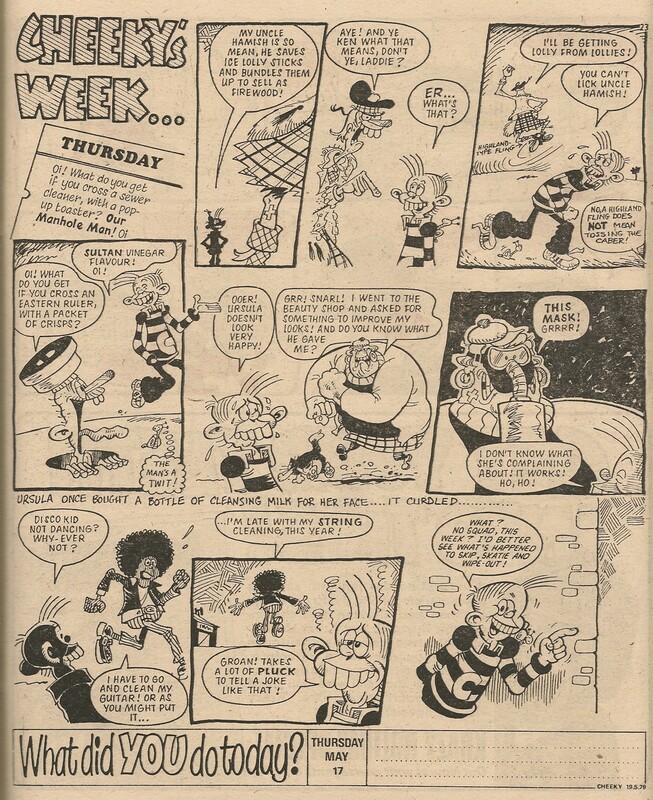 In Cheeky Weekly dated 06 October 1979 Jimmy drew another four pages of Cheeky fun, and the edition dated 20 October 1979 contained Jimmy's final Cheeky's Week work, amounting to four elements plus the front cover encounter between the toothy funster and Manhole Man. Jimmy's final Cheeky's Week page. In total Jimmy delivered 18 Cheeky's Week elements, plus one front cover. During his tenure as a Cheeky's Week artist, Jimmy also drew Speed Squad, which he continued to do after his Cheeky's Week contributions ended. Can it really be 37 years since Cheeky Weekly introduced its new look? Yes it can, and the Great News blog can prove it.